Now: bar with clean sightlines and local beverages. 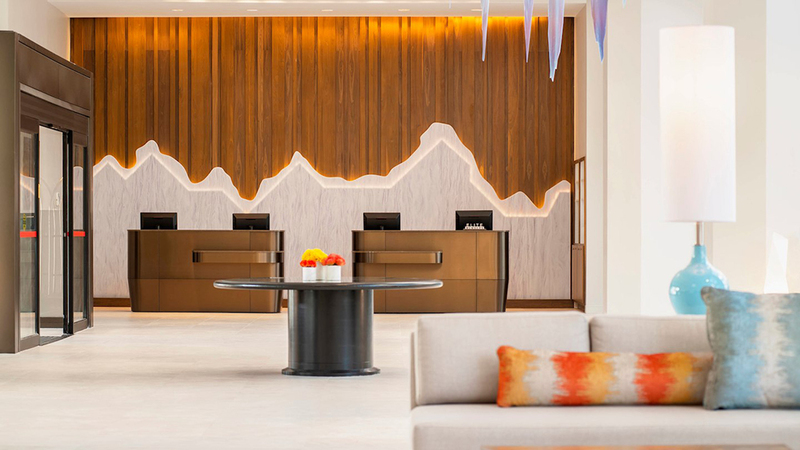 TRANSFORMING THE DESIGN OF HOTEL public spaces is necessary to the lifeblood of any innkeeper. 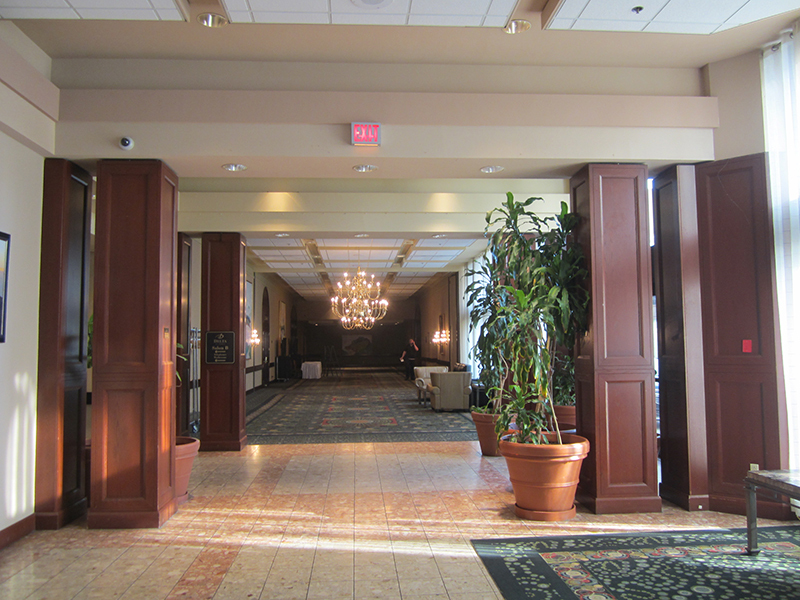 The Delta Hotels by Marriott St. John’s Conference Centre in Newfoundland was certainly in need of a transfusion in the spring of 2016. According to Kara MacGregor, principal at Mac Interior Design of Halifax, N.S., her firm was given the mandate to provide a visual refresh for the hotel — without closing the business down during renovations. 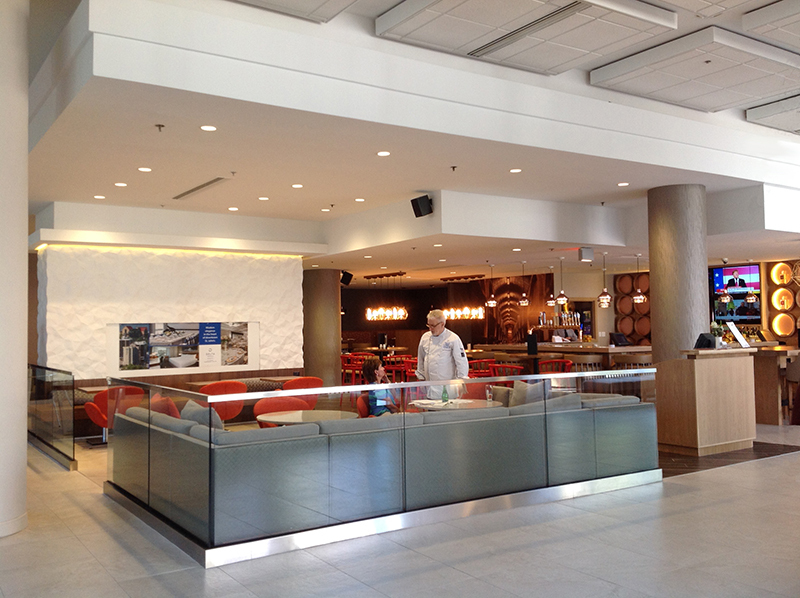 With a new convention centre attached to the hotel, Mac Interior Design knew it was going to drive a lot of business through restaurant and bar areas, so MacGregor really wanted to capture the food and beverage components. 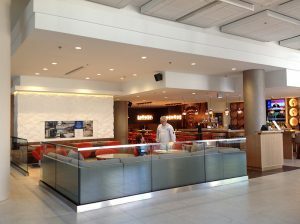 She knew that in order to get some return on investment, her firm had to really improve the visual and the access to the lobby bar and to the restaurant so that people coming from the convention centre would be enticed into stopping and spending. Before: pinks and beiges on display. Once the design opened up sightlines, then the challenge was to update the rest of the finishes such as the carpets and the flooring. “The tile flooring used to be a marble conglomerate two toned kind of pink and beige,” says MacGregor. 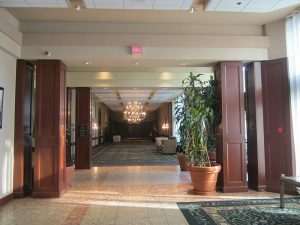 “It had been there from the time the hotel was built and was cracking and had served its time.” A much more contemporary appearance was provided with the choice of solid body porcelain tile. In addition, Fat Albert light fixtures were replaced with LED strips with the ability to drop the light level and create moods in the evening. Now: front desk echoes visions of iceberg alley. A custom wall-to-wall carpet echoing the “iceberg alley” theme was manufactured to cover the floors in the ballroom, meeting room and hallway areas. Made of a 42-ounce CYP (Computer Yarn Placement Technology) solution- dyed nylon, the pattern was designed to make the installers’ jobs easier, allowing for cuts to match more readily. “There has been a real excitement not just with the guests but within the community too,” says MacGregor about the response to the hotel’s completed makeover earlier this year as office workers from adjacent buildings pass through. “In the bar we have these oak barrels cut and mounted to the wall either side of the bar,” she says. The barrels feature locally-made spirits such as seaweed gin, however, and the taps all offer local craft Newfoundland beers, making the spot a hit with the locals.